Playa Hermosa, which translates to beautiful beach, is located in the northern Guanacaste province, on the Papagayo Peninsula in Costa Rica. At a short 25-minute drive from Liberia’s Daniel Oduber Quirós International Airport, Hermosa is one of the closest beach communities to an international airport in the entire country. The Costa Rican capital, San Jose, is approximately a five-hour drive away. Hermosa is a place strongly worth considering if you desire living in warm temperatures, with high 80’s F to low 90’s F by day, and high 70’s F to low 80’s F at night, nearly year-round. Add in frequent sunshine with the rainiest months being August to October, with only a few stray showers and occasional downpours. And, you have in this little piece of the tropics, one of the driest places in the country. Situated in a protected cove, the town of Hermosa resides between lively Playas del Coco to the south, and Playa Panama to the north. Approximately one mile long, Playa Hermosa is lined with fig and palm trees, with the beach in the shape of a horseshoe. As the sand is volcanic in origin it has a salt and pepper color and a fine, soft texture. A path meanders around the beach for easy walkability and features shaded picnic tables, benches, and a children’s playground. Since the cove is protected, the waves are small and without riptides or undercurrents. This makes conditions for swimming and water sports ideal. SUP paddleboarding, skimboarding, and snorkeling are popular water sports here. 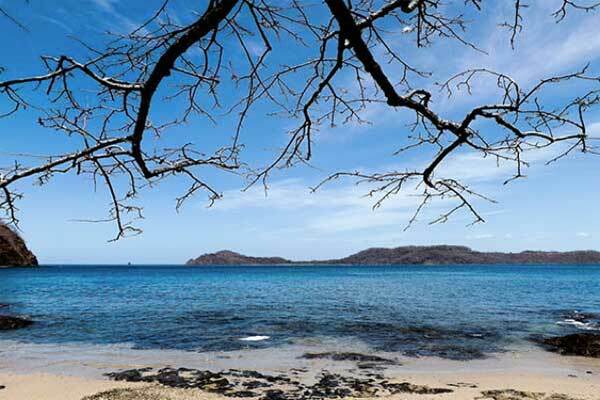 Playa Hermosa also consistently holds a bandera azul (blue flag) status, the highest rating a beach can acquire for cleanliness and water quality. The Papagayo Peninsula is prolific for deep sea fishing for varieties such as mahi-hahi, tuna, rooster fish, marlin, and other catch and release big game fish. These seas are especially good during “green” season because the rains wash dead wood from the hills into the ocean. This natural wood creates a multitude of nutrients for sea life and hiding places for fish to spawn and nest. Therefore, the fish are closer to the shore and to the surface making it an angler’s dream. Although this quaint and peaceful community itself is small, with the population fluctuating seasonally from high 100’s to the low 1000’s, it is well developed and boasts all the basic amenities you would need to live comfortably with high-quality boutique hotels, bars with live music, and international open-air restaurants dotting the oceanfront. The population mainly consists of an equal mix of expats, mainly North Americans and Europeans, Ticos (Costa Rican natives), and vacationers. The residents here are generally tightly knit and are willing to donate money for various fundraising efforts to make the community a better place. In fact, Hermosa is in the process of creating a new recycling program and residents routinely volunteer for beach clean ups. There is also a Salve Monos (Save the Monkeys) program in place, working in conjunction with the University of Costa Rica to preserve, document, save, and enhance the dwindling Howler Monkey population in Hermosa. Hermosa town is situated in a valley with much of the real estate development in the surrounding hills. It is one of the few Costa Rican towns with a movie theatre showing first run movies in English. It also has a miniature golf course, a gymnasium, a pharmacy, a hair salon, an ATM, plus a grocery store in the center of town to satisfy shopping needs from fresh produce to imported wines. As Hermosa is fairly concentrated you do not have to own a car here. However, if you do own a car you will open your world to the nearby restaurants, bars, and big grocery stores of Playas del Coco and to the provincial capital, Liberia. Many coastal-loving expats prefer to call this area home because of the nearby world-class hospitals, CIMA and San Rafaél, and the central hub of commerce including banking and attorneys as well as car dealerships, and a new Wal-Mart. Many of Costa Rica’s national parks and tourist attractions are within an hour’s drive from Hermosa, including Rincon de la Vieja National Park, Palo Verde National Park, and Santa Rosa National Park. These parks provide a great opportunity to see wildlife and experience a few of Costa Rica’s diverse ecosystems, including an active volcano. The Papagayo Peninsula also boasts multiple 5-star luxury resorts near to Hermosa, such as the Four Seasons, Andaz, and the country’s first, soon to be opened, Planet Hollywood. Like anywhere in the world, the price of real estate varies greatly based on whether the property has a view, distance from the beach, and the square footage. However, given the size of the community here, there are many choices from condos to single family homes in Hermosa town. For example, a two-bedroom, two-bathroom home with a loft, carport, and a pool, but without a view can be found for around $200,000. With a better view comes a bigger price, so if you want a view, you would need to double that price and increase it as you move up the hill. These houses serve up more spectacular views and increased square footage. Rentals are easy to find here, since it is a high-volume vacation area. But, keep in mind accommodation caters from mid-to-high end. Rents for a modest two-bedroom, two-bathroom home can be found for $1,000 a month. If you are looking for something a little larger like a three-bedroom, three-bathroom home, you are likely to pay around $1,500 and upwards. Below is an example of a monthly budget for a couple renting in Hermosa, including groceries transport, and day-to-day expenses. If you’re a seeking a small, safe, and tranquil piece of beach paradise with plenty of sunshine, stunning views, and proximity to big city amenities, Playa Hermosa may be the perfect place to start your new expat life.